VIRTUAL because it is completely online and interactive. MUSEUM because it is about private collections from all over the world. BLOG because it is a place of cultural comparison and exchange of views. The owner guarantees that this item has been acquired and hold in a legal way. 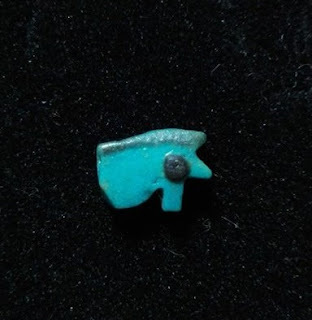 Egyptian bichrome faience Wedjat amulet (the eye of Horus) belonging to the Late Period. 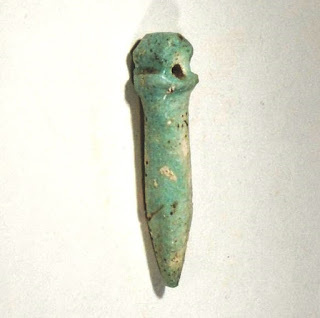 The longitudinal hole suggests it was used as a wearable accessory, maybe in a necklace or in a bracelet. 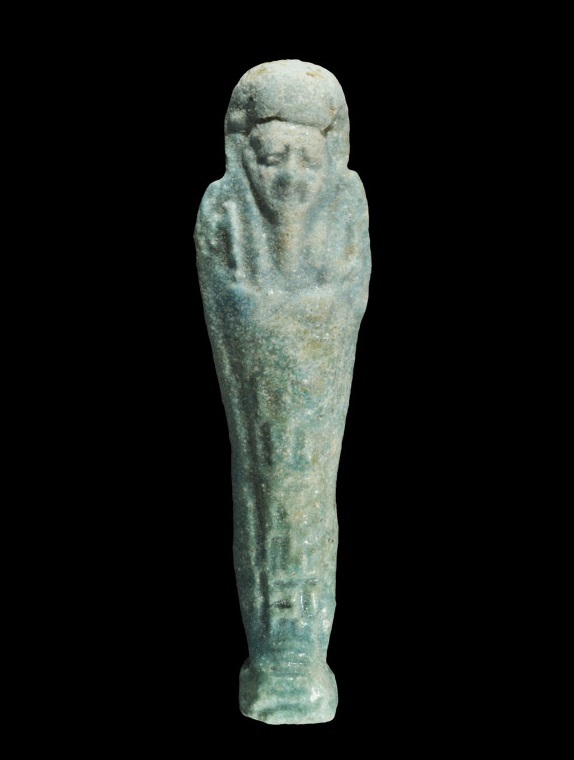 Wedjat amulets were very common amulets in the ancient Egypt. 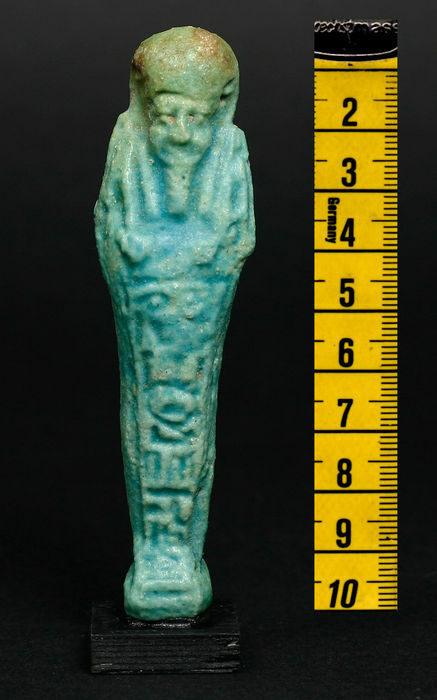 They are often made in faience, often bichrome (black and blue/green) and could symbolize the Sun (Ra) or the Moon (Osiris). 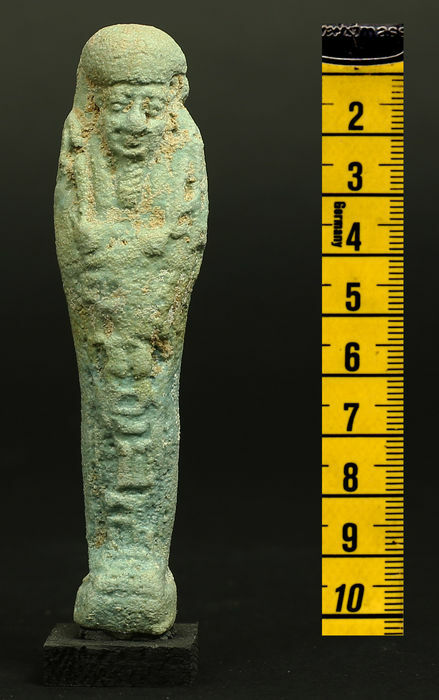 Here is a selection of ushabtis that are similar to the faience one in the Virtual Museum [#2]. They probably come from its same grave and same mold. Anubis Ancient Art is an ancient art gallery based in Rotterdam. Timeline Auction is an auction house based in Harwich. Here is a collection of similar ushabtis from the same mold. 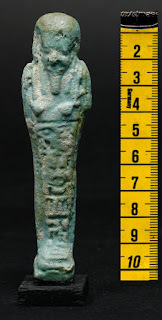 Inscribed Egyptian faience ushabti belonging to the Late Period (27th - 30th dynasty). 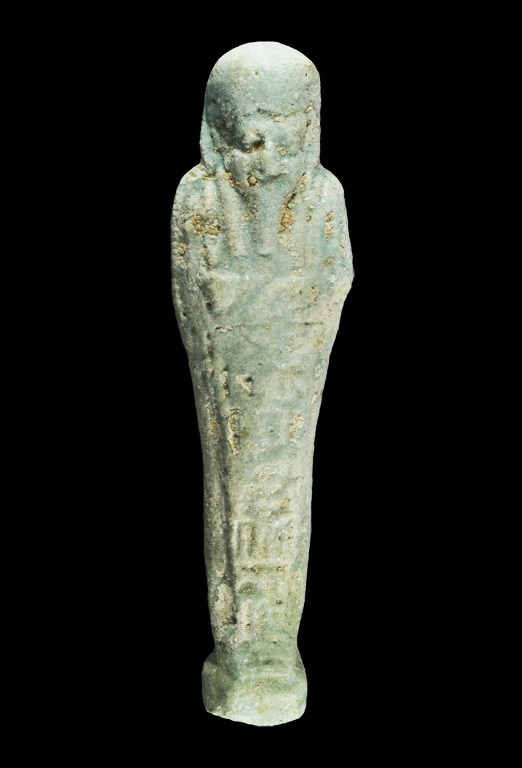 The figure follows the funerary tradition: it is mummiform with crossed arms and Osirian beard. It wears a typical headress and brings two agricultural tools in his hands. The frontal vertical panel is inscribed with hieroglyphs. 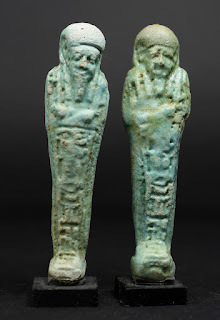 In ancient Egypt, Ushabti (or Shabits) were funerary figures placed in tombs among the grave goods. They were intended to act as servants of the deceased (above all in agricultual works). Their use started during the Middle Kingdom and developed through the following centuries. 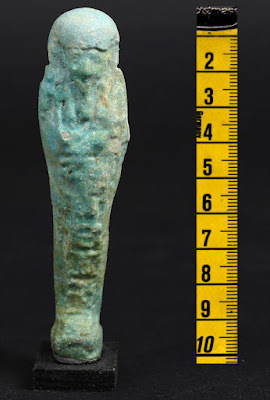 The most common materials were faience, wood and pottery. The inscriptions were taken from the 6th chapter of the "Book of the Dead" or from other funerary traditions. 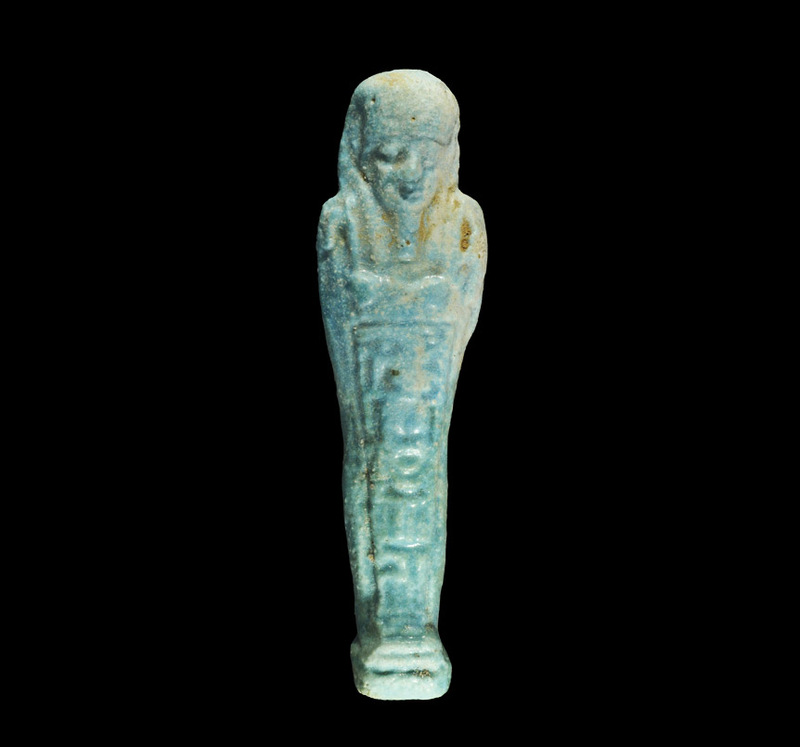 Soon a hypotesis on the ushabti text will be published on this blog. Typical Egyptian faience papyrus amulet belonging to the Late Period. The hole on the top suggests it was used as a pendant. Papyrus amulets were very common amulets in the ancient Egypt. They are often made in faience or lapis lazuli with a color range shifting from green to blue. 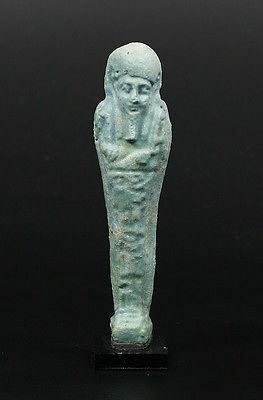 The papyrus amulets symbolized youthful force and vitality. Egyptian cornelian scarab amulet belonging to the Late Period. The carving on the top surface outlines the head, the chest and the elytra. The bottom oval surface is devoid of epigraphs. The longitudinal hole suggests his use by the living, for beauty and protection purposes. Scarabs were among the most common amulets in the ancient Egypt. They symbolized the god Ra and the cycle of death and rebirth. 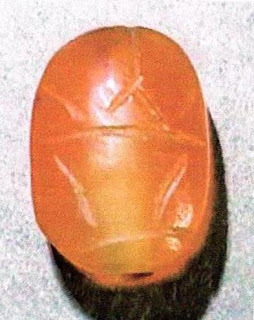 They were used both by the living (such as this cornelian scarab) and the dead (such as the "Heart Scarab" highly important in the ritual of mummification).